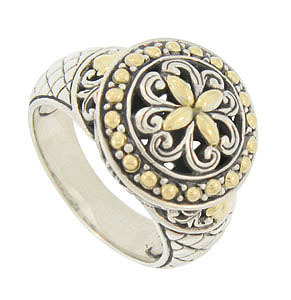 This sparkling antique style sterling silver ring features a round medallion adorned with bold engraved scrollwork and 18K yellow gold leaves. 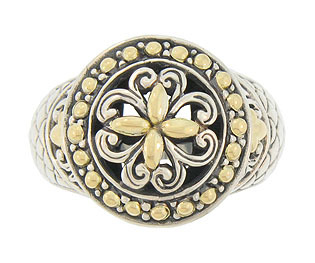 Golden milgrain surrounds the circular central medallion, while scalloped engraving covers the band. 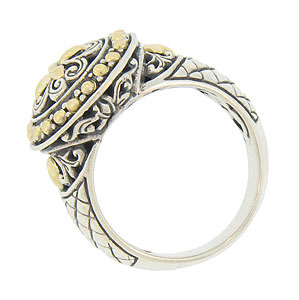 Cutwork vines and yellow gold leaves adorn the sides and shoulders of this elegant piece. 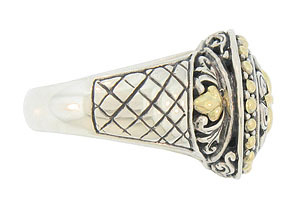 The ring measures 15.36 mm in width. Size 6. We can re-size.